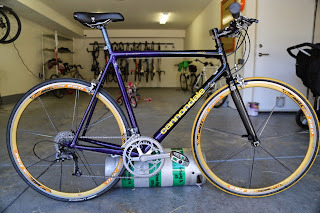 Cannondale did a lot of fade jobs in the early-mid 90s, and the purple ones are some of the coolest. This one, a 54cm from '93 or so, was too cheap to pass up - $60, including functional Forté (Performance) carbon/alloy fork. Including shipping, about $85. Cheap. 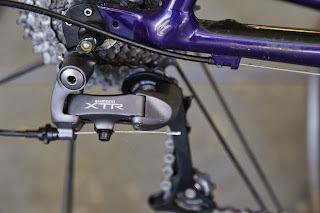 Having just bought up a bunch of NOS XTR/XT stuff from Murphy, the shifters are brand-new NOS XT 9-speed, and the rear derailer is an NOS XTR 8-speed (works fine). The brakes are Dura-Ace 7400 (parts bin), as are the cranks. This generation is among the more elegant Shimano made, with the caveat/bummer that the 7400 derailer only works with 8-speed shifters, which aren't supported in this garage. The Rolfs aren't going to stay on for city duty, but they look cool with the yellow Cannondale script. 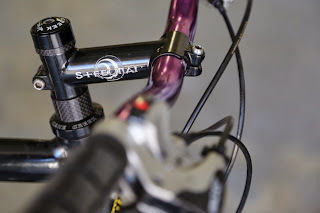 The Steelman stem is now an extremely expensive item ($400? ), but I had it in the bin so WTF. 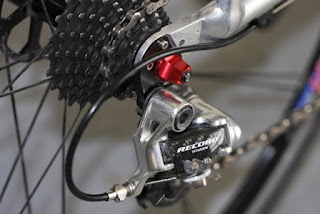 Headset is the usual Cane Creek, which still makes reasonably priced 1" stuff. Scored this lovely, lovely thing off ebay. Still deciding how to build it up, but may start with a track-style rig just so I can ride it while I acquire the 70s Super Record stuff. Tubes are Reynolds 531, their top alloy at the time. 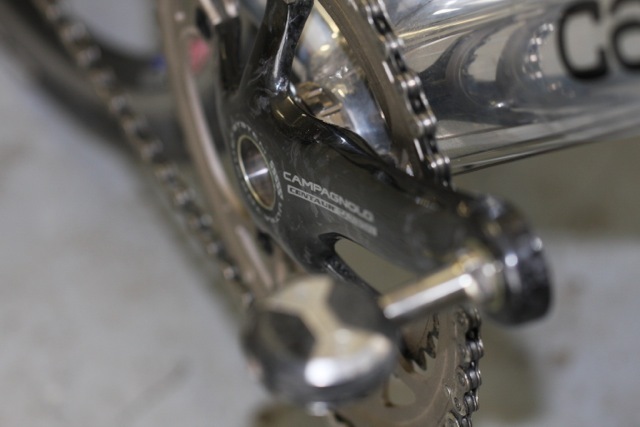 Dropouts are Campagnolo front & rear. Headset is Campy Record. Reynolds decals are usually pretty cool, but this one is my favorite. 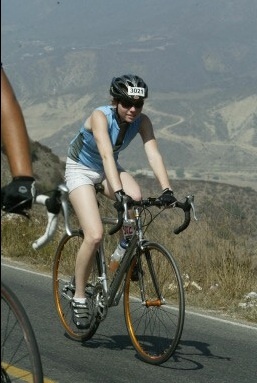 Ok maybe it's a tie with the 6-4 Titanium one on my Moots SL. Haven't decided on rims yet, but these are the hubs. Period-correct thread-on freewheel Record units, 32-hole. Beautiful. Update: we had an altercation between this bike and the house... everyone forgets their bike is on the roof of the car at least once right? Well, it finally happened. Screwed up the Open Pro CD wheels, so I put some reasonable alternatives on. Need to swap out this racy 11-23 cassette with the 11-32 hillclimber. Rolf Vector Pros with tubular Tufo Elites makes sense for a commuter bike, right? I bought this frame a long time ago and used it as a regular road bike (did the death valley century on it, ouch), then as a geared commuter with bar-ends & bullhorns, then a single-speed commuter with bullhorns for riding to Urchin HQ in San Diego, then as a very comfortable and fast beach cruiser for Mission Beach boardwalk duty, and now, finally, as a Caltrain bike commuter/hillclimber, with very low gearing for going up Folsom St. Don't seem to have any pics of the first version (normal road bike), but here are some other variants. 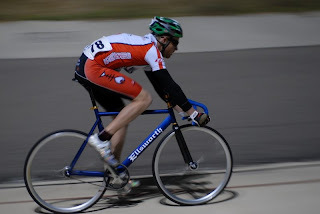 Perhaps this is an ignominious state for a somewhat "serious" road frame, but you know what, it's really fun & comfortable to ride like this, and I think it looks sorta cool. Wheels are pretty matchy -- Open Pro CDs front and rear -- but with a King front hub, and Paul WORD rear. Front whee was found on ebay cheap, rear was built up by Mike. But then, in Sept. 2011, we moved up onto Bernal Hill, which entails the ~18% Folsom St. grade. Time for gears I guess. Went with a 1x9 setup. 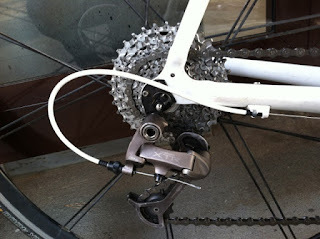 Dura-Ace 7700 crank w/ 42t chainring in front, 11-32 cassette in back, with XTR derailer from the parts bin. Rolf Vigor is ridiculous overkill, but it's an orphan and it's handy, so oh well. Thanks M. Gaiman! 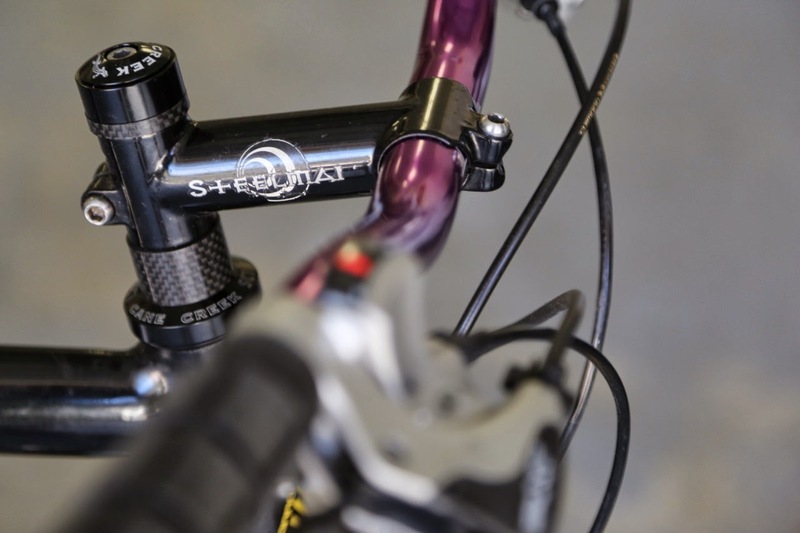 Paul Thumbie plus Shimano bar-end shifter make a super crisp shifting setup. Dig it. The curent state of this bike is my favorite. Upright and comfortable like a cruiser, fast and efficient like a road bike, equally good on flats or hills, hassle-free flat pedals, and pretty light at 20.5 lbs. This project started, as usual, when I found this deal on ebay. 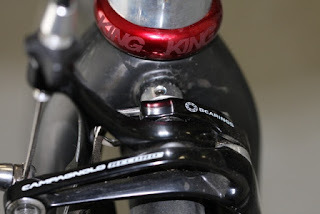 $225 for a frame, fork, and chris king headset... well, couldn't not buy that. The headset alone is worth almost half that. 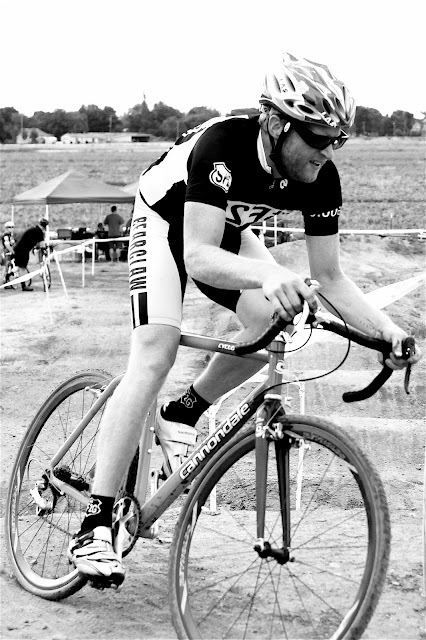 The original iteration of this bike was a touring/rain setup with fenders etc., but since I never toured anywhere, it got repurposed into a cyclocross race bike. Disc brakes are far superior of course, but the mechanical Avids are not super impressive, and I figure once Shimano comes out with hydraulic road levers, that will be the time to switch. In the meantime, cantilevers set up well work tolerably ok. 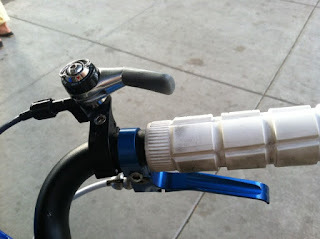 The key addition to this thing was the Reynolds Cirro tubular wheels. I got these free from a race team because they were damaged -- each rim had a small crack from impact with a pothole. So I got them repaired by a carbon-experienced friend (Trystan), glued on some Tufos, and bam, this thing is hella light. 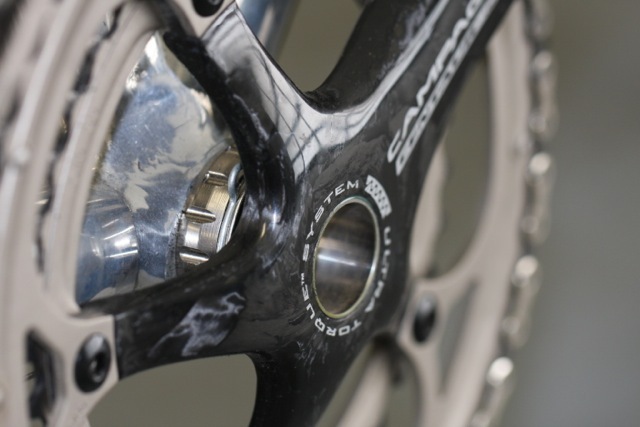 These wheels are about the lightest you can get this side of $3k-each-Lightweights. 1150g for the set(!) With some other light stuff -- Easton EC90 carbon bars, a carbon Record lever, Alpha-Q fork, and SLR seat/Thomson Masterpiece. Drivetrain is Dura-Ace 7700 1x9 with Paul chainkeeper (an absolute must -- have had a few races ruined by dropped chains that couldn't quickly be put back on due to lack of front derailer). 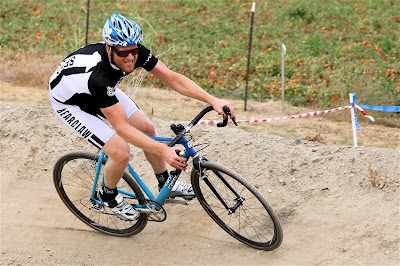 I think older Cannondale cyclocross frames are the best way to go for a low-budget/high-performance cx race bike. Light, strong, cheap, and made in USA. This is one you won't see every day. Apparently this was made for the 2000 Sidney Olympics Polish track team. Sat in a warehouse for years, until Ellsworth decided to ebay the unused frames in about 2008. 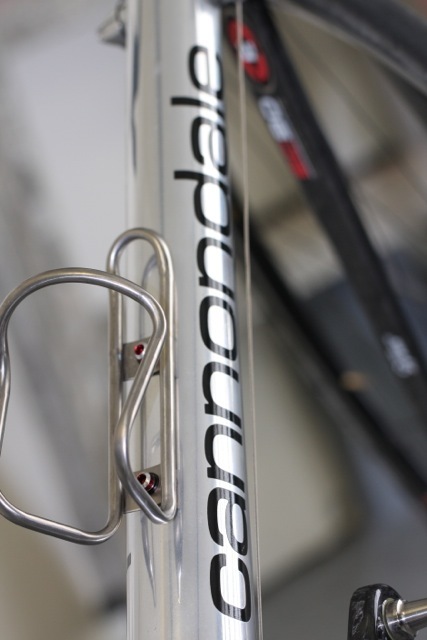 Per the frame sticker, these are made from Easton superlight scandium/aluminum tubing, and indeed they are light. 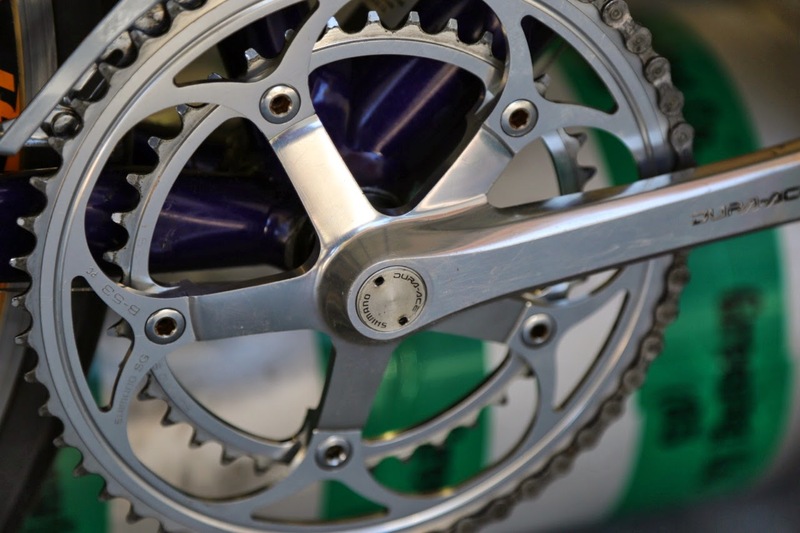 This one weighs in at 13.99 lbs., with old Campy front wheel and quick-release seatpost clamp. Could be quite a bit lighter. These were made by someone besides Ellsworth in Portland I'm told, but I'm not 100% sure about that. No shortage of capable builders up there. Anyway, some odd things about it. Heading to the San Diego velodrome with the Ellsworth and the 90s Cannondale track bike in the '78 300D... a night that would not end particularly well. Ouch! 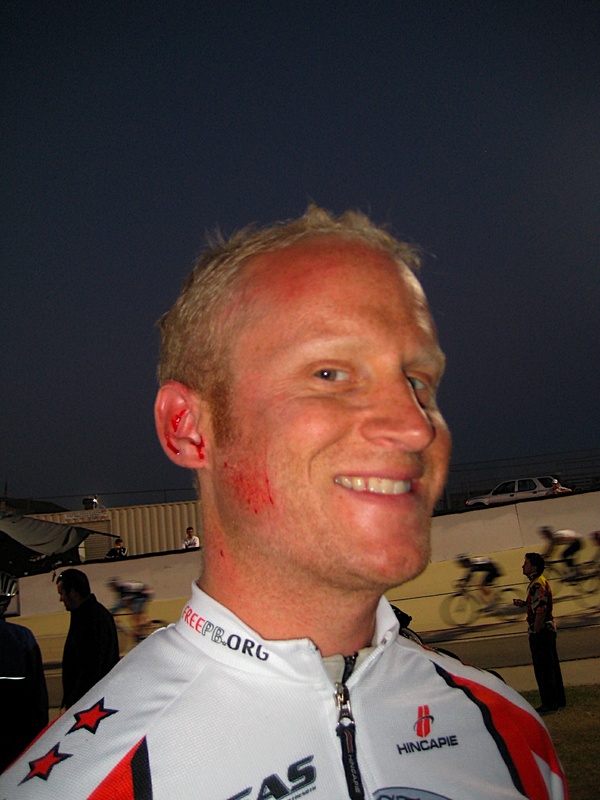 the velodrome concrete is like 100 grit sandpaper, and is very effective at removing skin. I don't recommend sliding across it at speed. What I do recommend wholeheartedly is real Japanese kieren gloves with armored kevlar knuckles. 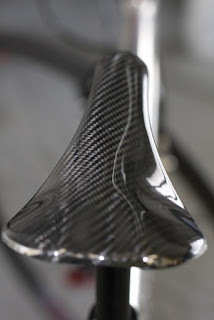 They are expensive -- ~$150, but you'll be very glad your hands didn't get destroyed if you ever crash. Small price to pay.